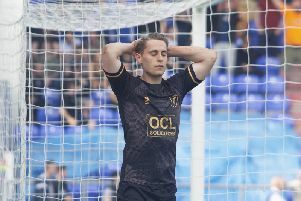 Mansfield Town fans are unhappy over the controversial introduction of 10 Premier League Academy sides into this coming season’s Johnstone’s Paint Trophy competition. The JPT has always been a way for Football League sides to reach a Wembley final without the involvement of the Premier League big boys. Now they will also face the cream of the crop of possible future Premier League talent in a move which many feel will devalue the competition. The move was approved by a vote at the Football League AGM in Portugal where Stags were one of many clubs who failed to vote either way and stayed on the fence. The competition will also change format, with a group stage being introduced before the knockout rounds. More than 4,700 football supporters have already signed a petition against the changes, and a number of Stags fans have reacted angrily, making their thoughts clear online. Johnny Paling said: “It’s a ridiculous idea - we should boycott the competition. Stephen J. Wells said: “I think its a joke. I appreciate that the FA are trying to get more game time for the next generation of players, but not this way. “Maybe they shouldn’t have stopped the loan system from this season which has seen the likes of Harry Kane get valuable first team action and development? “It’s ridiculous mixing a first team competition with youth teams. Russ Clarkson said: “Who the hell would be interested in watching Stags v Hull U21s on a cold February Tuesday night? Ferret added: “What an insult to the Football League clubs and fans. These young players should be getting their chances in the Premier League first teams rather than being usurped by some unknown continental player. “Bring over the big names, yes, but let’s limit the number of non-English players PL clubs can play in a starting XI for starters. However, Sharp said: “I actually don’t think is a bad idea. “The trophy itself is a poor competition until the quarters at least, and attendances reflect that. “The Premier League have agreed to put up an extra million in prize money across the competition and this may boost crowds, particularly younger fans, so I don’t see a downside. Accrington Stanley, AFC Wimbledon, Portsmouth, Hartlepool United, Luton Town and Port Vale are believed to have voted against the proposals with only Chesterfield and Oxford United voting for it.